Greenleaf Book Group Press, 9781608324071, 320pp. We live in a most challenging time. Many of us struggle, emotionally, ethically, and spiritually. We seem headed toward less compassion and consideration, failing to overcome that basic instinct that often leads to evil in human behavior--self-preservation at all costs. Yet within each of us a new future is stirring. We can become better people and build a better world by opting for good over evil--one choice at a time. In The Constant Choice, Peter Georgescu offers a gripping narrative of his journey from childhood captivity in a Romanian labor camp to his role as CEO of the world-renowned advertising agency Young & Rubicam. His traumatic youth--his parents' exile from their homeland, his grandfather's murder in prison, his neighbors' betrayal of one another--led to a lifelong struggle to grasp humanity's moral nature. Despite his conviction when he arrived on American soil that he had reached the land of the good, he discovered a more subtle evil at work all around him. Yet he also thrived through the generosity of one benefactor after another. Goodness, he found, isn't inherent; it evolves from daily choice. 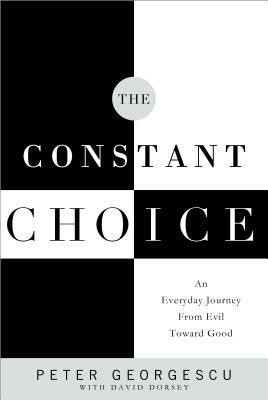 Through decades of reflection on human behavior, as well as philosophical and spiritual exploration, Peter arrived at a new perspective on the significance of our habitual choices. Every decision we make alters our biological nature, for better or worse--a model that has been confirmed by recent science. The Constant Choice reveals a path for changing who we are and the future of humanity. It's up to each of us to become activists for good. Peter A. Georgescu arrived in America in 1954, after years of forced labor as a child in communist Romania. Today, he is chairman emeritus of Young & Rubicam Inc., which has more than 300 offices around the globe, vice chairman of New York Presbyterian Hospital, a member of the Council on Foreign Relations, and a graduate of Princeton and Stanford Business School. His lifelong quest to answer the question Why does evil exist? led him to ongoing philosophical and spiritual study and an integrative view of morality, religion, and our power to do good and change the world.David Dorsey is the author of The Force, a critically acclaimed nonfiction narrative, and has written for a variety of national magazines. He lives with his wife in Rochester, NY.